Recently, I was watching someone rinse a plastic polyethylene plant-potting container in a bleach solution for reuse. I was pretty sure that pot needed to be thoroughly rinsed of organic matter prior to the bleach rinse. The observation made me think of several reasons why a gardener needs to know how kill plant pathogenic microbes, e.g., effectiveness of our thermal composting process, best product to spray on our pruning shears or, preparation of a previously purposed plastic pot for propagation. Heat destroys microbes best and heat with humidity is even better. However, except during our thermal composting process, heating to 149F for two hours is not practical. As such, I tried to get some answers about products that are available and familiar. Ethanol (think Everclear) can kill most organisms but it is highly flammable and evaporates quickly. It dries out the organism (which is why the similar product, isopropyl alcohol, is better as a disinfectant for the skin). Alcohols reportedly won’t kill some spores and they harden rubber and some plastics on tools. I could not get a clear idea whether hydrogen peroxide is a good pathogen hunter. Articles refer to its effectiveness, especially on inanimate surfaces, but indicate that hydrogen dioxide is a superior disinfectant on plant production surfaces. Quaternary ammonium chloride. Hmm. 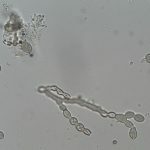 There is a lot of controversy about Quats and they are reported to be not always effective against the tough customer – the fungal resting spores. This brings me to a possible unsung hero – iodine. Remember when you went camping where the water was bad. You mixed the two tablets in water and waited. That second tablet helps with the discoloring and the taste and also is a solubilizing agent. One potential downside is shelf life – about five years. This study is way more complex that I could have ever imagined. There is no one size fits all solution. 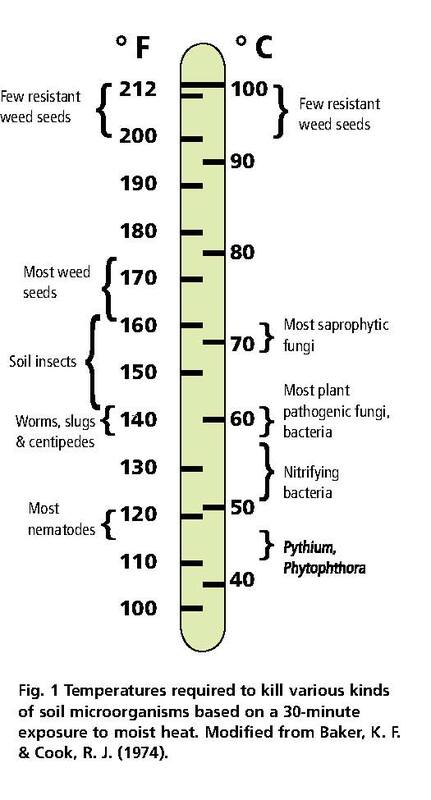 Shown here is a popular chart from two State of Washington professors (who are also fine authors of plant pathology books). Investigation on the fungitoxic effect of an iodine solution on three plant pathogens in vitro. Bengt Boysen. 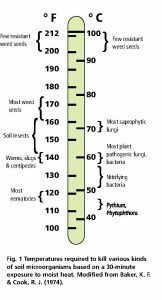 Soil Solarization and Thermal Death: A Logarithmic Relationship Between Time and Temperature for Four Soilborne Plant Pathogens. Quaternary ammonium compounds are the most commonly employed broad-spectrum hard surface disinfectants employed in animal research facilities. 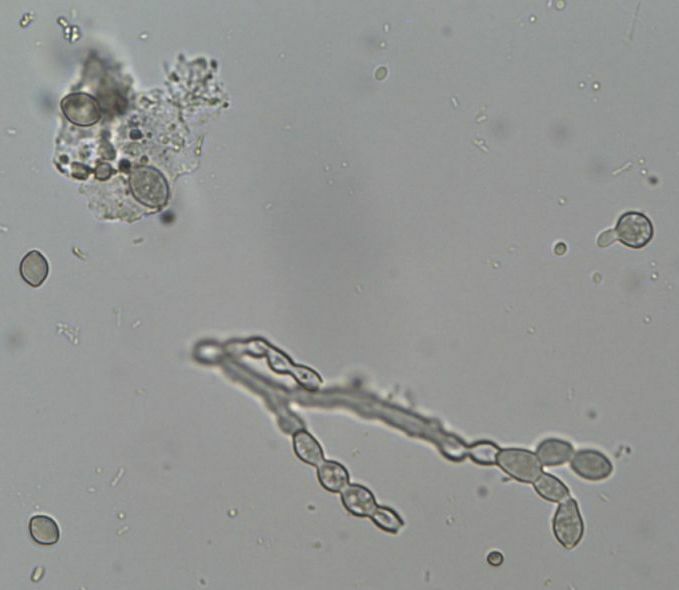 This entry was posted in Plants, Uncategorized and tagged plant pathology, resting spores, sterilization, thermal compost on March 26, 2019 by Ruth.